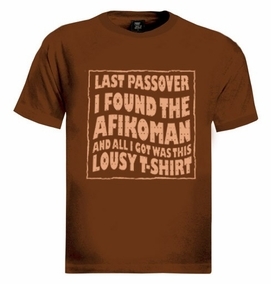 Last Passover I found the Afikoman and all I got was this lousy T- shirt. the "lousy T-shirt" t-shirt is the timeless classic souvenir of just about everything. 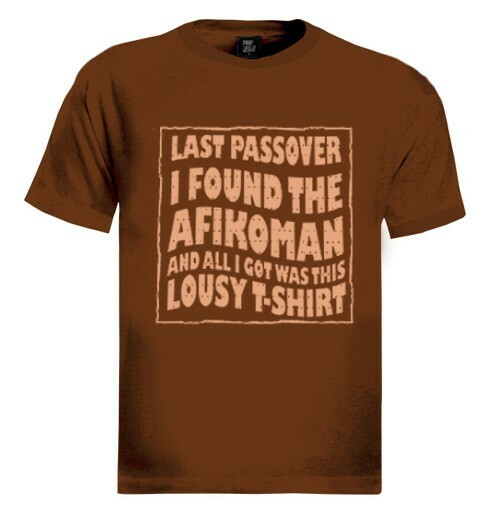 Get our "I found the Afikoman t-shirt" today, if you too had an awesome Passover Seder night that you don't want to soon forget! Order up! Our t-shirts are made of 100% cotton and are long lasting with bright colors. Our products are all designed and printed in Israel.